This right here is a new form of personal transportation. Some might even say that it's the perfect accessory for riding around playing Pokemon GO...all day, every day. 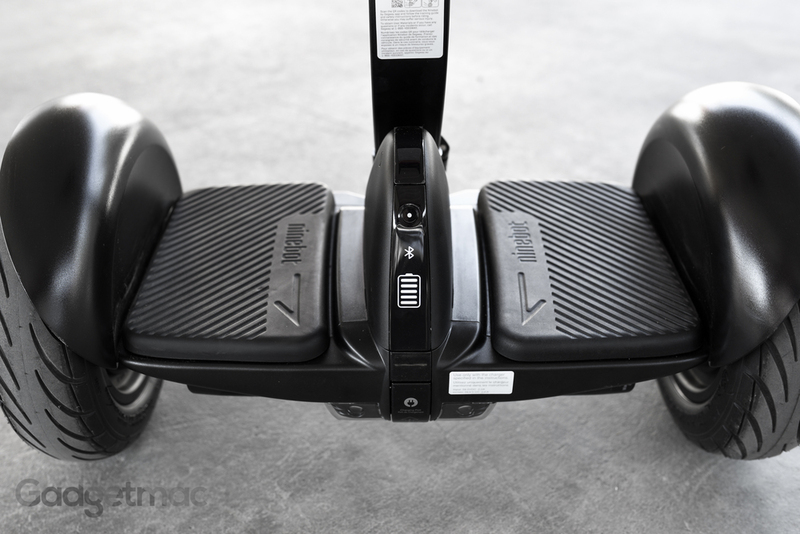 It's called the Ninebot miniPRO by a little known company who practically invented the concept of electric self-balancing scooters that move you around when you lean forward. 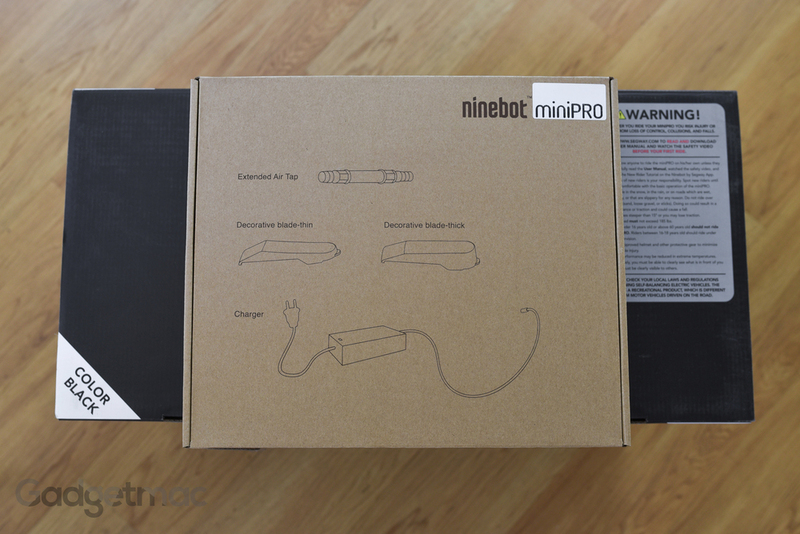 But unlike these small and potentially explosive "hoverboards", the Ninebot miniPRO is a steroid-using, tricked-out version from the people that brought you the original all-terrain Segway, albeit a much more portable, and smarter iteration fit for today's technologically advanced tech enthusiasts. 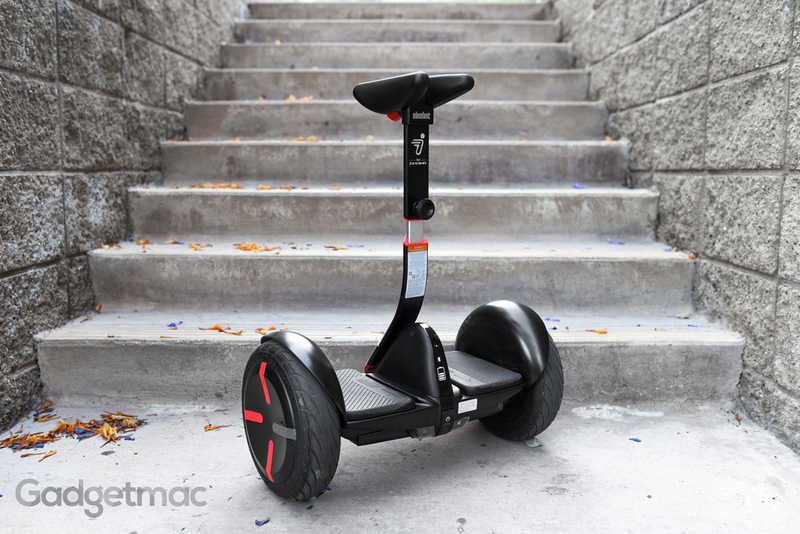 So how does this thing stack up against something like the Boosted Board? Let's find out! 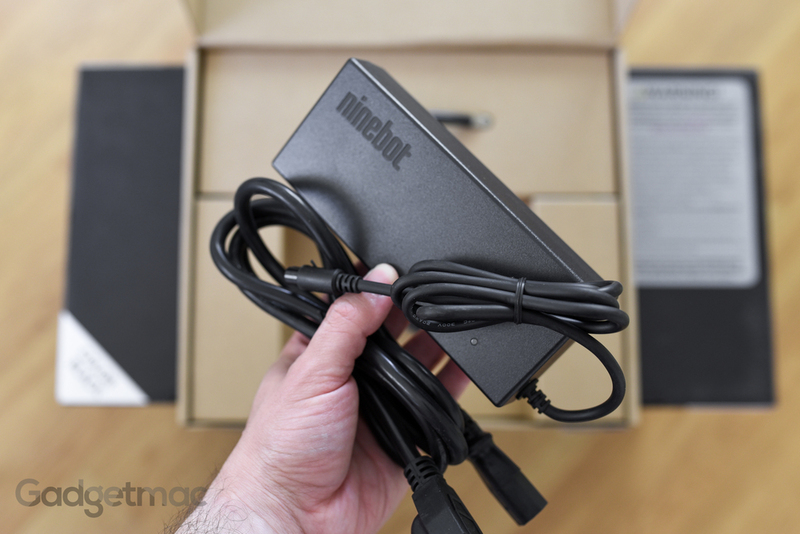 The charger that comes with the miniPRO is a typical brick charger with a detachable extension cable and a charging status LED light built in. You can take this charger with you when you travel overseas as it supports international voltages. Expect a full charge in just under 4 hours, so you may want to carry this charger with you whenever possible. Let's talk about power for a moment. Unlike the multiple battery size and performance options that are available when buying a Boosted Board, the miniPRO at this point and time only comes in one configuration - a 1600 watt model capable of reaching speeds of up to 11mph with a range of up to 14 miles on a full charge, depending of course on how heavy you are and what type of terrain you're riding on. Available on either white or in this black colorway, on paper the miniPRO can safely carry a person weighing up to 220lb. But I will say that it looks like it can handle much heavier payloads. That said, the less you weigh the more range you'll be able to squeeze out of this. Weighing around 205 myself, I haven't experienced any significant drop in performance when riding up hills and for long distances. 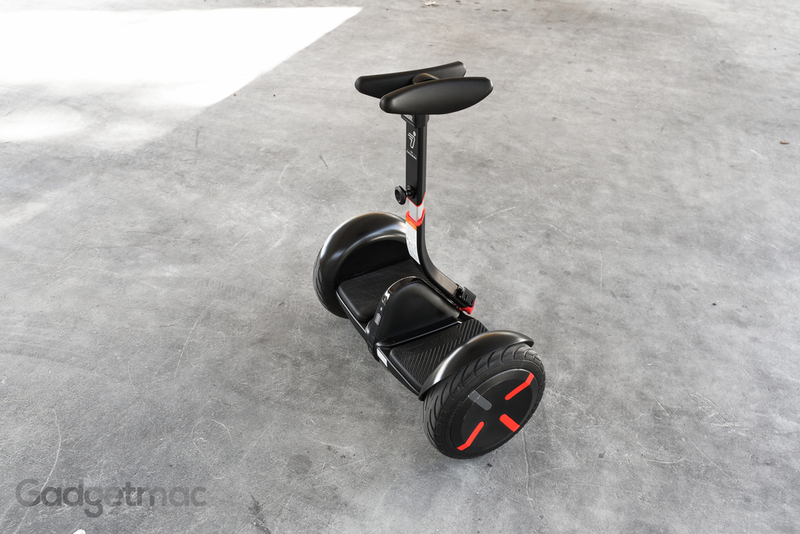 What separates Segway's miniPRO from all of these generic self-balancing scooters are some smart features such as a security alarm that can be controlled using your phone. When activated, the miniPRO will sound an alarm, vibrate and flash its lights when someone tries to move or touch it which is a pretty nifty little safety feature. Another feature is of course the Bluetooth functionality that ties in with the companion app where you can fully customize the miniPRO's lighting features, wirelessly and remotely control the miniPRO making it your very own R/C robot, set speed limits for other riders such as younger kids, see how fast you're going in real time with a speedometer interface, check the precise battery life and temperature of the vehicle, and other useful things such as the available range in miles or kilometers - all in a surprisingly intuitive and responsive app interface. And if you take a look at the front, you’ll notice that there are two forward-facing headlights which automatically turn on when it gets very dark thanks to the built-in ambient light sensor. These lights put out a significant amount of bright light that will illuminate your path when riding at night, albeit for a short distance. I’ve ridden the miniPRO for hours with these lights on and was pleasantly surprised to find that they haven’t impacted battery life in any noticeable way. That being said, you can turn them off completely via the app. The front of the miniPRO is also a permanent home to an impressively bright and legible LED display that constantly displays a battery meter along with other status functions such as the Bluetooth pairing mode, security alarm lock symbol, and speed limiter symbol. This display is flanked by the unit's on/off button and a protected charging input down below. At the back of the miniPRO are dual LED light strips that can either pulsate, flash, stay solid, or bounce around depending on how you adjust them using the app. And when you brake with the miniPRO by leaning back, these lights will of course turn bright red to signal that you are braking. Another cool feature is that these also act as turn signals that automatically signal when you turn left or right. But what truly makes Segway's take on the "hoverboard"-esque rideable is the inclusion of a radically new way of steering. At first glance, it may look as if you can ride the miniPRO whilst sitting down since Segway decided that its iconic Segway style handlebar is a thing of the past. But that seat post looking thing is actually the new way of how you steer...by using your knees of all body parts. Instead of using one of your feet to turn left or right, you nudge the stick between your legs sideways to turn while leaning forward to accelerate and backwards to brake or reverse. 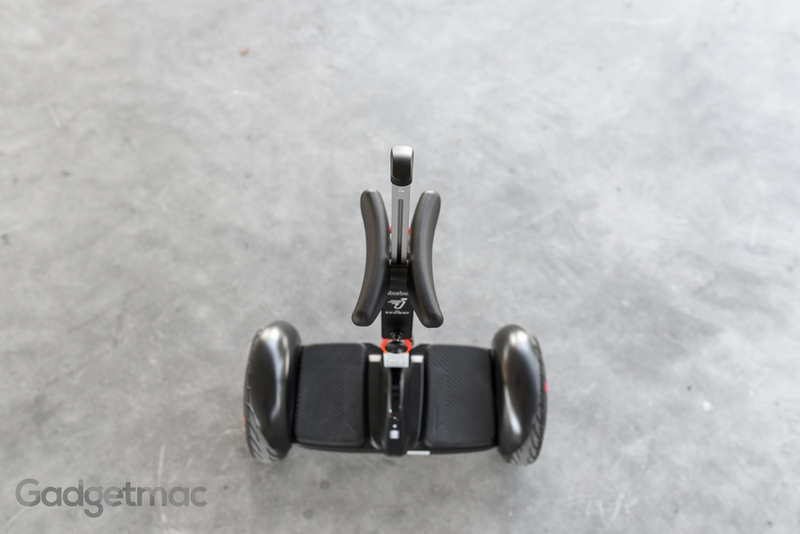 This concept has been taken from the traditional Segway handlebar that would tilt from side to side in order to steer and made to fit the compact chassis of the Ninebot miniPRO. I've had people say that it's much easier to ride because of this height-adjustable knee bar, and it just works so well. Even though there's a lot of padding, my knees did feel very sore after my initial few days of riding the miniPRO. Fortunately, as your body adjusts to this, you'll notice that your legs will get less fatigued and more you ride. The amazing thing about having this steering ability using your knees is that you can accelerate forward using just one of your feet like you would when driving a car. It's quite intuitive and relaxing and enables you to use what feels most comfortable to your driving style. Forget the Boosted Board, this is honestly the most awesome and easiest rideable I have ever used. 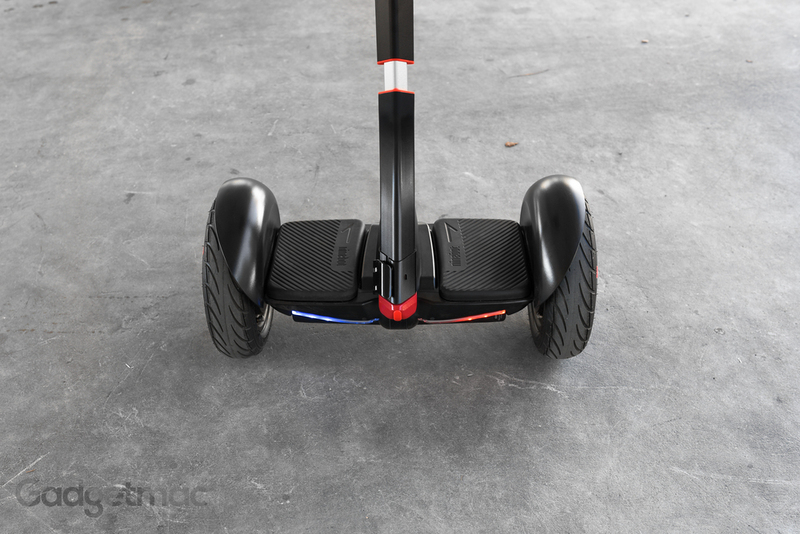 Having never stepped foot on a so called hoverboard or self-balancing scooter of any kind, I can safely say that learning to ride Segway's miniPRO was at first a somewhat daunting experience due to my own fear of falling off, but I quickly realized I was overthinking it. Within a couple of minutes I had this whole self-balancing riding experience down and felt as if I had ridden it for months. Remember I've never stepped foot on any type of rideable and still can't safely ride a skateboard. So if you're someone like me with zero balancing skills, you'll be able to ride the miniPRO in a matter of minutes...and expertly within hours if not much quicker. It's amazingly intuitive once you figure out what your body needs to do in order to familiarize yourself with this new type of maneuverability. I do suggest that on your first try, use a chair or a bar stool to help you get over that fear of losing control. Because it's really all in your mind. The miniPRO does more than enough to balance and stabilize your weight when you step on, which is the reason why it's so easy to ride unlike a skateboard that can in an instant slide underneath your feet. It's an incredibly steady version of a cheaply made hoverboard. One of the two biggest things I noticed right away was just how quiet the miniPRO operated even at top speed. It's about 90% quieter than a Boosted Board. Not only that but the relatively big rubber, air filled 10.5" tires absorb a lot of bumps and road vibrations offering a really smooth and comfortable riding experience much like a bike with suspension would. The miniPRO is snappy, it's highly responsive to input and it's capable of braking quickly yet steadily, ensuring that you don't fall back accidentally if you try to go over a speed bump for example. While you can't pick it up and carry it with you indoors or when your battery runs out like you easily could a Boosted Board, the miniPRO features a retractable handle that can be pulled out from the top of the steering column that enables you to conveniently hand-steer it when you're not riding it. There's a power-assist mode that automatically kicks in when you pull the bar out so no need to worry about manually lugging this around. You could also detach the knee bar entirely thanks to a quick-release system. Battery performance has been brilliant during our testing. Having ridden the miniPRO at top speed almost consistently and up some steep inclines, I was able to get a range of 12.4 miles before the battery required charging. And even then, I could continue to ride the miniPRO only at very low speeds. While not exactly reaching Segway's 14 mile range, I'm still very impressed by these real world results while also nearing the maximum weight limit. Suffice it to say you'll be able to cover some serious ground with such great battery performance, in the day or during the dark. Although not the fastest ridable around, the miniPRO maxes out at about 11mph. But that's where things can get a bit annoying. Meaning that if you accelerate a bit above that the miniPRO will automatically reduce its speed and essentially limits you to a top constant speed of around 10mph, which is unfortunate but will be plenty fast for most users. But what's even more annoying is that it keeps beeping every time you reach that top limit, which is often if you like riding as fast as possible. There's currently no workaround or an option to turn off this audible notification via the app. Our miniPRO has been recently updated to firmware V1.3.1 as of this review, but the speed warning and beeping is still present unfortunately. Much like the Boosted Board Dual+, the miniPRO doesn't struggle when it comes to riding up steep inclines. With that said, it can do anything a Boosted Board can except go as fast as one. With its surprisingly high ground clearance, large air-inflated tires and powerful electric motors, and from my personal experience with the miniPRO, it'll power drive its way through any type of obstacle you will encounter during your ride such as bumps, humps, uneven terrain, road cracks and gaps, small to medium sized rocks, twigs, dry dirt paths, grass, and it has no trouble running over feet either. Yes it looks awesome, but also more importantly it doesn't feel like a cheaply made toy but actually more like a solidly built piece of cycling equipment with its magnesium alloy chassis serving as a sturdy riding platform. And that's already great news straight out of the box because for the asking price, you'd expect no less. The tires are of a high quality, the adjustable steering column can take the daily abuse of whenever the miniPRO occasionally tips over when you're not careful and forget that you've turned it off, and the overall rubberized step-on platform doesn't make any plasticky creaking noises when you step on. That being said, the only omission preventing this rideable from being completely badass is that it lacks weather-proofing, meaning that it better not get wet or else you could find yourself with a 30lb rolling paperweight. The possibilities this thing affords are enormous if you think about it. You can use it if you're a photographer to shoot around town for miles, use it to ride to school, the coffee shop, in the park, in trails, to meet friends if you can't drive, and of course to catch all them pocket monsters. I'm really glad to have been given this opportunity to test drive this futuristic piece of gear by Segway. But at the end of the day, what really matters is if it's worth buying. 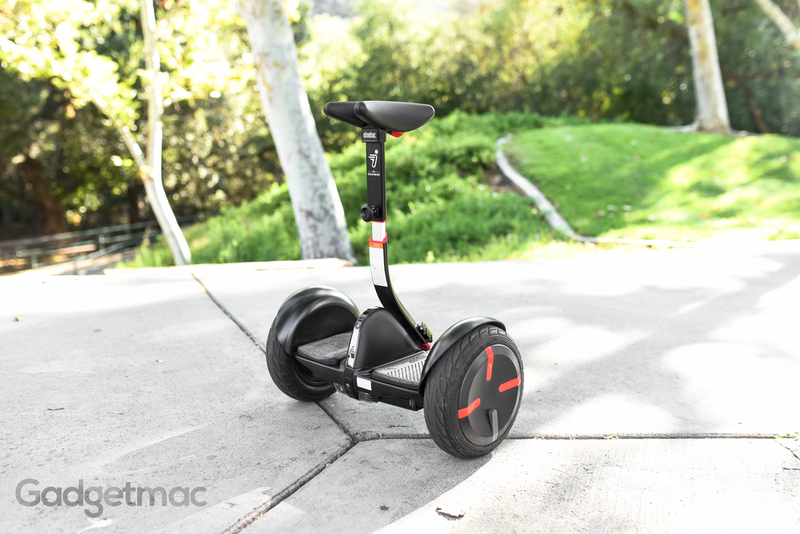 And as much fun as we had during our time with the Segway miniPRO, we'd recommend that you wait until the price comes down a little and for Segway to fix that pesky speed limiter that keeps beeping every time you want to go as fast as the speed advertised on the box. Which you'll quickly find is all of the time. 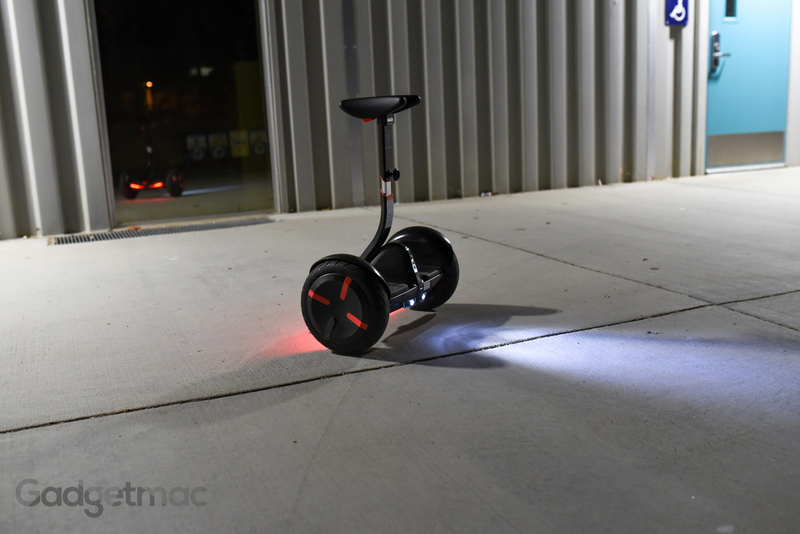 Since Ninebot and Segway seem to issue consistent firmware updates with new features and improvements, we're sure this nuisance will eventually get fixed. 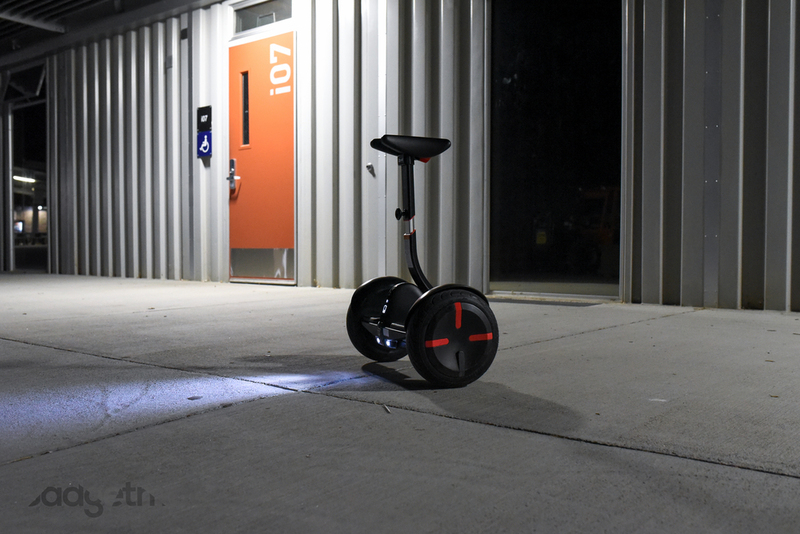 Other than that, the Segway miniPRO offers a fun and enjoyably smooth riding experience that's very easy to pick up for novice users, it's as silent as a Tesla, has a great iOS companion app, the extraordinarily good battery life and range of it is really impressive, and the smart and highly effective auto-balancing technology, shock-absorbing big rubber tires, high-quality construction - along with Segway's uniquely intuitive steering feature makes this one – if not the best, most advanced self-balancing rideable you can buy right now. For daily commuting or just leisurely cruising around, the miniPRO is a high-end, highly manoeuvrable, go-anywhere mobility device.